The Green Machine got back to winning ways with a strong defensive performance to hang on to a fine win away at Sheffield Tigers. Dale started strongly and opened the scoring with a scintillating try from Rian Hamilton. Dale won turnover ball in their own 22 and Harry Bullough started the move by running the ball out of his 22. An excellent off load to Hamilton saw the full back set off, breaking a tackle, to beat the cover to score from 70 metres. No conversion but Jack Blakeney-Edwards knocked over a penalty kick from 30 metres minutes later. The visitors came close to scoring a second try with a sweeping move involving outstanding handling which broke down 5 metres short. Tigers started getting control of the ball and were rewarded before half time with three points from the boot of Mark Ireland. Wharfedale had dominated possession and territory in the first half and the slender lead of 8 points to 3 was a poor return for their efforts. Dale came out strongly at the start of the second half and after nine phases Phil Woodhead nipped through a gap to score under the posts. Blakeney-Edwards added the extras. Sheffield hit back with an unconverted try by Henri Packard. Tigers were reduced to 14 men after some foul play from their second row, Ashley Holland. Wharfedale then scored from a catch and drive with James Tyson being awarded the score. Up stepped Blakeney-Edwards to nail the touch line conversion that was to prove invaluable. Sheffield got back into the game with some strong rugby and a moderate penalty count grew against Dale. It was enough for the ref to eventually give James Tyson a yellow card for a technical offence. Two minutes later George Hedgley was also yellow carded for another technical offence and Dale were down to 13 men. The depleted ranks seemed to be surviving well and, still dominating at the scrum, a scrum penalty allowed them to get out of their 22. Outstanding ball carrying from Houghton, Ward and Stockdale took play into Sheffield’s 22 but the ball was lost. Dale’s defence was only broken when a kick ahead bounced back into Jamie Broadley’s hands for him to cross the whitewash. The conversion hit the post and also bounced back, this time to Wharfedale’s relief. A converted Robbie Davidson try for Tigers set up a close finish but Dale showed good control in the final minutes to claim the 4 points. 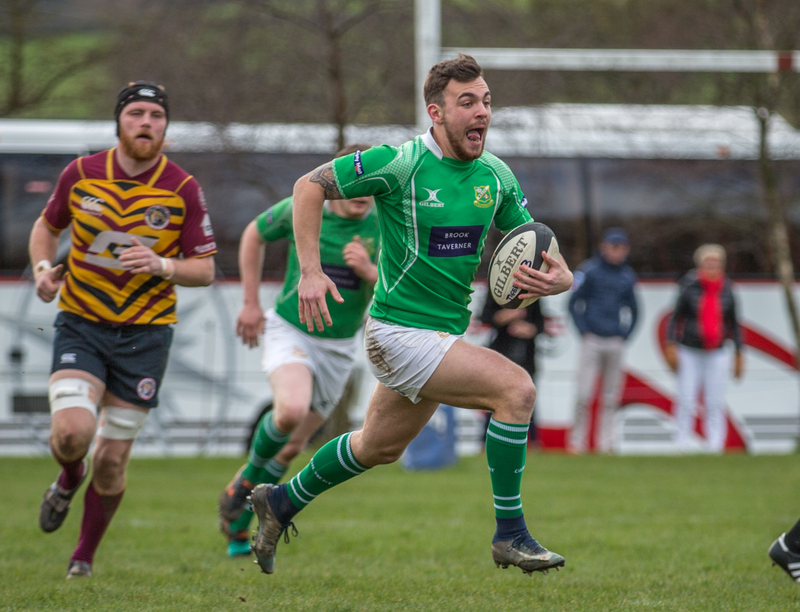 Jon Skurr, Wharfedale’s forward’s coach, commented after the match “This was a great away win for the team, especially after two disappointing performances. It showed a strength of character, highlighted when the team were down to 13 men, the team still managed to finish on top which showed great determination. The squad has been decimated by injuries but this only showed the extensive depth in the squad with players coming into the team”. Skurr did not want to highlight any individuals as he praised the team performance but he did complement the front row of Toms Asejevs, Dan Stockdale and Reece Ward for their “high level of performance”. It was indeed the front row that established a platform for Dale to work off by dominating the set piece. It gave room for Phil Woodhead to play and create chances for Dale to get on the front foot. Not only were the props, Ward and Asejevs, effective at the scrum but they also contributed all over the park with strong tackling, ball carrying and clearing out at the ruck. Rob Baldwin was Dale’s outstanding player on the day, getting through a tremendous shift for the full 80 minutes. It was great to see “the boss” back to his best and enjoying the experience as well. Rian Hamilton was the pick of the backs because of the brilliant try but it was Harry Bullough’s work coming out of defence that set it up. All the backs did their share in defence and kept the talented Tigers at bay. The defence was strengthened by Chris Walker playing at centre. This proved to be a very good experiment and Walker added punch as well as resolve in midfield. Oli Cicognini had another outstanding match and was always eager to get involved, even adding his weight to the scrum when needed! Wharfedale: – Rian Hamilton, Ralph Wellock, Harry Bullough, Chris Walker, Oli Cicognini, Jack Blakeney-Edwards, Phil Woodhead (Sam Gaudie 45), Toms Asejevs, Dan Stockdale, Reece Ward, George Hedgley (c), Ben Leacock, Matty Houghton, James Tyson, Rob Baldwin. Replacements not used: – Jack Hirst, Jake Parkinson, Elliot Stockton, Tom Mann.